Enameling refers to a process of depositing and fusing pulverized glass of various colors onto a surface, usually metal or porcelain. For more technical & historical details on this decorative method, please see Wikipedia's article on Enameling. In general, it requires a skillful series of steps, a kiln for firing as well as several tools and chemicals that are used to prepare and later refine the finished surface. 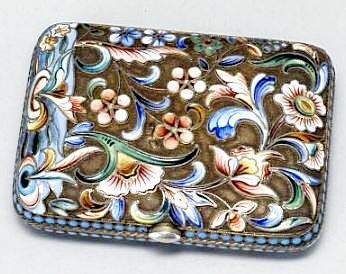 In addition to industrial applications, most common objects in the Decorative Arts that are now collectible or antique, include Enameled Silver, Enameled Jewelry, Cloisonne, Champleve, Enameled Porcelain, Enameled Glass or Crystal and many other objets d'art. Because of its ancient origins, the art of enameling has spread far and wide around the world from old cultures to more recent or current popular art forms. Chinese, as well as European and American folk art, was until recently the principal domain of enamel-ware, but nowadays most artisans work at studios or as skilled craftsmen for makers of luxury goods. The dazzling color combinations with enamel's characteristic sheen and brilliance are second to none in adorning and embellishing beautiful pieces that can be worn or displayed with pride and admiration. Although a relatively low-cost process, the real overhead in creating enameled masterpieces are the patience and skill that are required. Exquisite enamel designs demand painstakingly long hours of attention to detail and extraordinarily experienced mastery of this technique. The artistic value of creating enamelware relies mostly on the selection of alluring colors and the size or multitude of the applied surfaces, that eventually render an appealing composition as the finished product. This affects its worth as a collectible in a very direct way and although age & condition are also key factors as always, the overall aesthetic weight is of the utmost importance. The subject matter or theme and of course the artistic style on decorative enamels, make them desirable to collectors depending on their fancy or taste and are highly subjective reasons. However, an interesting provenance [historical significance] or other precious materials that have been combined to create a piece, can have a notable effect on its appraisal value. For example, antique Chinese enameled porcelain or glass have historical dimensions and are highly desirable. Similarly, enameled silver jewelry or ornate enameled old European porcelain, have a high intrinsic value that must be added to their beauty. Intricate work, such as in the case of Cloisonne, especially older Japanese or Russian examples, have a particular appeal to collectors and fetch high prices at auction. Folk enameled jewelry, for example by Native American artisans, is pretty and collectible but is usually up to the beholder to value it fairly. Below are some examples of enamelware of all types from our Pricing Guides database.